Welcome to the 10th annual Duel! Thanks for making the duel such a great event! for always being ready when queued. They lent out many radio parts vital to other teams. Your dedication has earned you the "A-10-Dance" Award! Sarah Nasson from Team 303. If you see a crowd of 303 students running to a young woman and screaming “Mom” at the top of their lungs, it is not a beloved parent… It is Sarah Nasson. We jokingly call her “Mom” in the Team 303 family. Through considering all that she does for our team, this nickname for Sarah Nasson is appropriate in every way possible, even though she does not have any children. From her loving nature to her engineering expertise, she is an ideal guide and role model for us, as students, to look up to. After serving as a member of Team 303 during her high school years, Sarah Nasson came back to the team as a committed and knowledgeable mentor. Regardless of the situation, her infectious enthusiasm for Robotics and first spreads to the rest of the team and boosts our morale. In high school, Sarah was named the “Pit Queen,” and it is a common sight even today to see her sporting her pit crew apron and working with students. 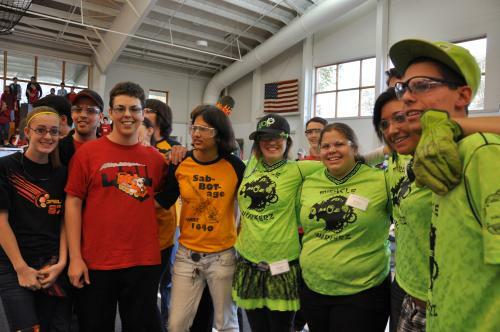 Regardless of her title, Sarah Nasson’s passion for Robotics is just as strong as it was a decade ago. To see a fellow Bridgewater-Raritan graduate contribute so much to our team years after graduating is both motivating and inspiring. As a female member of the team, Sarah is a model for the rapidly increasing number of female students on 303. Through her work, she exemplifies that women can contribute to engineering and lays to rest any assumptions that engineering is a field of science dominated by males. Despite a busy schedule managing her career as a teacher and family, Sarah still devotes her time not only to Team 303, but also to first at a regional level volunteer. Since graduating, Sarah Nasson has served as a Regional Planning committee member, a KOP distribution coordinator, a Deployed Field maintenance worker, and a Newark Kick-off event manager. This commitment is not always easy, but her dedication to her service sets a good example for the rest of the team to reach out to the community and eventually return to the team after they graduate to help out. If Sarah can set aside time for Team 303, we all certainly can too. Since Sarah’s return, there has been a marked improvement in the communication between the students and the mentors on 303. This is in part due to her ability to relate to the students and maintain a strong relationship with everyone involved in the team. Wherever the team meets, Sarah is always there to greet everyone with a friendly smile and a laugh. Even during the late hours of building or the stress of competitions, her enthusiasm never wavers throughout the busy build season. Despite her relatively young age, is undoubtedly rich with experience. Sarah Nasson’s growth from student to alumna to volunteer and mentor allows her to share a wealth of knowledge to the students of Team 303. Whenever a team member needs advice regarding an issue with the robot, they can count on Sarah for an intelligent, comprehensive response and a helping hand. It is hard to imagine a better mentor than Sarah Nasson and we all know that we are truly blessed to have her.